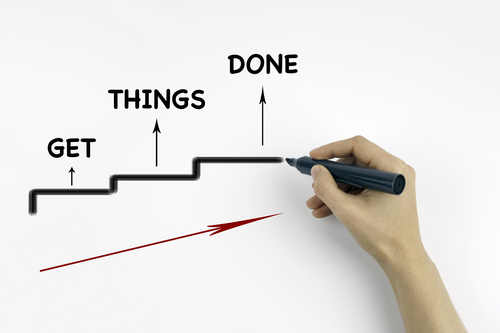 Contrary to what you may think, GTD is a fairly simple methodology. Basically, it’s about managing a few lists with some rules that anyone can understand and apply. David Allen emphasizes that it is necessary to capture everything that might be something you have to do, keeping it in a reliable system that you can review at any time, out of your head! (and there are scientifically sound arguments in favor of this habit). Everything means 100% of things. Those that you have to do soon and those that you have to do someday, the big ones and the small ones, those that have to do with your work and those that are part of your personal life, the significant ones and the others as well. Why is this so important? Because everything you consider incomplete will require your attention steadily and unconsciously. Thinking of the same things repeatedly makes you waste time and generates stress. If you get these things into a trusted system, out of your mind, you will stop thinking about them. You get a clear idea of the volume of things you have to deal with. You can increase your concentration in any activity, since you are not distracted by indefinite stuff hitting your head. You will learn where your commitments are, which will allow you to say no to things you should not and do not want to do. It boosts your creativity because now you are using your mind to think about things, not to remember things. Everything that comes into your life can’t just stay there. You must discipline yourself to make decisions about all your stuff. You must know clearly what your commitment to each thing is and decide what to do—or what not to do—about it. In order for your organization to work properly, you need to empty your inbox on a regular basis, that is, to clarify what each of the things that you have previously captured mean. Clarify does not mean do, it means you must decide what each thing is and what you are going to do with it. Why should you do this? Because this way you become aware of reality and you can focus on what is important without letting yourself be carried away by the urgent. And you lower your level of anxiety. You gain control of the situation, since you know exactly what things you’re not doing. Every time you make a decision there is a feeling of relief and you feel less pressure because you can see things more clearly. You become accountable for your things and that will raise your self-esteem. Your ability to get things done will be reinforced. You are more productive. Reviewing everything lets you know what things you are not doing. You’ll ensure you have defined the next action step for each incomplete and this will allow you to advance all your projects. If everything is under control, your head remains free to think at a higher level. Clarifying your current situation and reviewing your long-term goals will help you make better decisions.